Villa Chloe is a grand, contemporary beach villa on Cape Yamu, Phuket, with sweepings views across the ocean with its boundaries dotted with verdant tropical foliage. With five bedrooms, a private swimming pool, living and dining spaces, etc. the villa is ideal for large-scale get-togethers with friends, families, and even for a corporate retreat. Besides the unbeatable location in the forefront of luxurious panoramas replete with nature’s splendour, the villa itself is a magnanimous modern structure with spacious bedrooms and modern amenities! Villa Chloe proudly presents five, well-furnished, air-conditioned bedrooms to its guests that guarantee comfort and luxury like never before. All five bedrooms, including the master bedroom, are furnished with king-sized beds, and even features TVs for relaxation. They open out to a splendid garden or the pool deck, beyond which lies an even more spectacular view. The air-conditioned bedrooms exude a definite luxe vibe with their golds, taupe, and champagne-coloured interiors. Large windows allow for ample natural lighting and fresh air to flood the bedrooms whenever possible! En-suite bathrooms accompany the bedrooms as well, fitted with the best quality amenities to make your stay even easier. Set in the middle of dazzling greenery with a wide variety of wild plants and tropical trees that seem to engulf the outdoor space, the almost Olympic-sized infinity swimming pool is all your dreams come true in one! With its aquamarine waters and stunning vista ahead, get ready to spend hours splashing away and swimming laps with an ease that can only be got while on a tropical getaway. Sun chairs, in-built loungers, and the patio furnished with circular rattan chairs have all been placed to suit your needs and afford a comfortable as well as relaxing atmosphere. 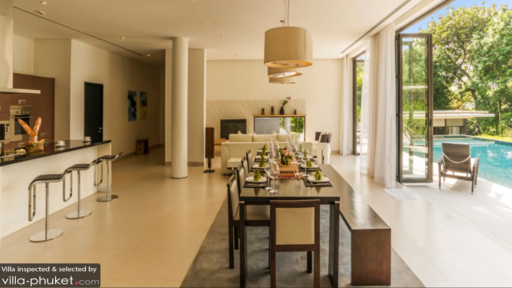 Featuring dominant modern interiors is the open-plan living room at Villa Chloe with its understated colour scheme featuring creamy walls and furniture, minimal décor, and overhead lighting that adds an opulence unlike any other. Opening out to the pool deck via glass doors, enjoy an unhindered view of the pool and nature’s abundance from the comfortable white sofas found in the living room. For your entertainment, the room has been fitted with a flat-screen TV and DVD player with so you can enjoy with loved ones. There is even a separate media room with massive, comfy couches, a large TV, surround sound, DVD, etc. for the ultimate movie night! For your kitchen and dining needs, everything you require is found under the same roof for ease of access and make it seem more inclusive so everyone can spend the most amount of time together. The dining area can seat up to ten people with direct ease and you can cook up a storm in the fully-equipped state-of-the-art kitchen that is done up in a modern, elegant style. A breakfast bar with high-stools is put in place for you to grab a drink or a quick bite in the morning. Villa Chloe is fully-staffed with a team that provides 24-hour security, pool/garden maintenance, housekeeping services, and for an additional charge even personal guest assistance. There are certain amenities you can make use of such as hiring a private chef, or renting transportation, indulging in in-house massages etc. at an extra cost. The private peninsula of Cape Yamu is an exclusive location in Phuket with utmost luxury, comfort, and privately-owned resorts at its helm. Enjoy a delectable meal at the ever-popular restaurant, Breeze at Cape Yamu, for quality Asian food. Relaxing walks along the beach and some sunset-viewing is something you can look forward to in this quiet piece of heaven.